Silver Monkeys (Cercopithecus doggetti) are found in Africa, central to southern Asia, Japan, and India. Silver Monkeys inhabit Rain forest, islands, steppes, mountains, and savanna, depending on species. Silver Monkeys are frugivorous and folivorous in nature, eating mainly fruits and leaves. In addition, they also eat small insects. Silver Monkeys generally have a narrow nose, a narrow septum, close-set nostrils directed forward or down, bony ear passages, two premolars in each half of each jaw and hard patches of bare skin (ischial callosities) on the buttocks. They also have cheek pouches. Silver monkeys are diurnal and arboreal. Like most of their relatives in the Cercopithecidae family, they live in groups with one dominant male and his female harem. Grooming develops bonding between offspring and female adults. Female Silver Monkeys initiate mating with the male. The female Silver monkey gives birth to a single offspring following a gestation period of 5 months. Breeding season occurs throughout the year. Infants are weaned at 6 months. Both male and female Silver monkeys reach sexual maturity at 3 years old. Similar to its relatives, the Silver Monkeys life span is around 20 – 25 years. As is true for other forest dwelling monkeys, Silver monkeys fall prey to leopards. Other potential predators include snakes and birds of prey. As a prey species, Silver monkeys probably have some impact on predator populations. In addition, they are likely to be important in seed dispersal because of their frugivory. The Golden Monkey (Cercopithecus kandti) is also known as the Sichuan Snub-nosed Monkey. The Golden Monkey is one of the most beautiful and rare animals in the world. Although it is said to be unique to China, it actually resides in the Albertines Rift in Africa. A great valley that runs north to south for some 5,000 kilometres, from northern Syria in Southwest Asia to central Mozambique in East Africa. Local people have long believed that Golden Monkey fur wards off rheumatism and in the past, only Manchurian officials were allowed to wear coats made of their pelts. Endemic to Albertines Rift, the Golden monkey is confined to the Virunga Volcanoes. 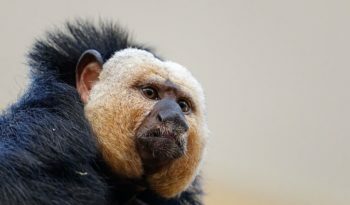 It lives at the highest altitude (over 10,000 feet) of any primate, and is one of the most endangered animals on earth, with only 1,500 individuals living in the wild in fragmented populations. Golden monkeys live mainly in the trees, although Golden Monkeys also spend a great deal of time on the ground. The Golden monkey has a soft pelt, a round head, short ears and a tail as long as or longer than its body length. Golden Monkeys vary in length between 57 and 76 centimetres with a tail of up to 72 centimetres long. A pair of bright and beautiful eyes sparkles on its azure-blue face. It has a small snub-nose and a sarcoma at the corner of its mouth, which becomes bigger and harder with time. Its long tresses resemble shiny, gold wool. Golden monkeys live in very large groups of up to 600 individuals dividing into bands of 60 – 70 individuals in the winter. Males and females make different calls, while it is known that members of the same group sing together. Grooming develops bonding between offspring and female adults. Golden Monkeys live in a harsh environment so they have adapted to a varied diet, ranging from tree leaves, pine and fir needles, bamboo shoots, buds, fruits, lichens, tree bark, insects, worms, small birds and their eggs. Female Golden Monkeys mature at about 4 – 5 years and produce one offspring after around 7 – 8 months gestation. Golden Monkeys have a life span similar to its relatives – 20 – 25 years. 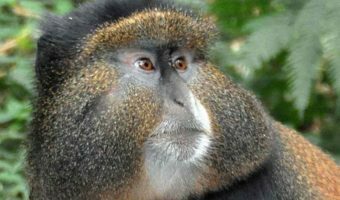 The Blue Monkey or Diademed Monkey (Cercopithecus mitis) is a species of guenon native to various parts of east, central and southern Africa, including the Congo River basin. The Blue Monkey is found in rain forests and montane bamboo forests, and lives largely in the forest canopy, coming to the ground infrequently. It is very dependent on humid, shady areas with plenty of water. Despite its name, the Blue Monkey is not noticeably blue. It has little hair on its face and this does sometimes give a blue appearance, however, it never has the vivid blue appearance of a mandrill, for example. The Blue Monkeys fur is short and mainly a grizzled brown colour apart from the face (which is dark with a pale or yellowish patch on the forehead – the ‘diadem’ from which the species derives its common name) and the mantle, which varies between subspecies. Typical sizes are from 50 to 65 centimetres in length (not including the tail, which is almost as long as the rest of the animal), with females weighing a little over 4 kilograms and males up to 8 kilograms. Blue Monkeys are catarrhine – the nostrils are close together and they face downward. The nail on each digit is flattened and the thumb is opposable. The Blue Monkey eats mainly fruit and leaves, however, it will take some slower-moving invertebrates. The Blue Monkey has cheek pouches to carry food in while it forages. Blue monkeys are diurnal and arboreal. Blue monkeys live in groups that range from 10 to 40 individuals, containing only a single adult male. The Blue Monkey is often found in groups with other species of monkeys such as the Red-Tailed Monkey and various Red Colobus monkeys. This is probably for added protection against predators. 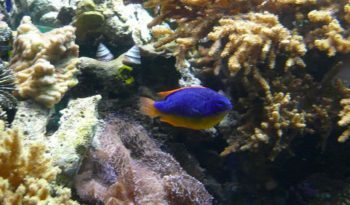 The groups have a unimale social system. The alpha male receives all of the copulations from the troop females. He also guards the troop against other conspecific troops and males. Female Blue Monkeys tend to join in confrontations with other conspecific troops. When takeovers occur, the former alpha male is often ousted from the group. Female Blue Monkeys are the ones who initiate mating with the male. The female Blue monkey gives birth to a single offspring following a gestation period of 5 months. Breeding season occurs throughout the year. Infants are weaned at 6 months. Both male and female Blue monkeys reach sexual maturity at 3 years old. The young are relatively well developed at birth, with open eyes and the capability to grasp their mother and support their own weight. Females provide their young with milk for about 6 months. Maternal care does occur amongst the female troop members. Longevity for this species has not been reported, but if Blue monkeys are like other members of the genus Cercopithecus, the maximum life span is probably around 20 years. As a prey species, these monkeys probably have some impact on predator populations. In addition, they are likely to be important in seed dispersal because of their frugivory. Blue Monkeys are listed with the IUCNI as vulnerable and on the US Federal list as threatened. Survival threats to Blue monkeys include habitat destruction, such as the clearing of rain forests. Blue monkeys are also destroyed for eating cultivated crops or destroying exotic trees. As is true for other forest dwelling monkeys, Blue monkeys fall prey to leopards. Other potential predators include snakes and birds of prey.